Long Pham definitely had one of the more disappointing days of any candidate vying for the CRA endorsement. After the first round of voting he finished just short of the 2/3 necessary for the endorsement. The second round of voting involved the wheels coming off the bus with Troy Edgar flipping the vote to get the 2/3 necessary for the endorsement himself. This entry was posted on March 29, 2012 at 9:10 AM	and is filed under 72nd Assembly District. Tagged: Long Pham. You can follow any responses to this entry through the RSS 2.0 feed. You can leave a response, or trackback from your own site. As Pham said to the CRA crowd, he got rolled by Ed Royce. Of course, Royce doesn’t represent ANYONE in the 72nd, but he swooped in late (along with Troy Edgar who almost didn’t make it himself) and begged the Fountain Valley delegation who was voting as a block (is that allowed?) to lay down and give their support to a carpetbagger from Los Alamitos who wasn’t even in the race a month before. Typical of the CRA, their only interest was that Edgar was pro-life — any other form of competence or experience in government or position on an issue didn’t matter. Edgar says he’s a successful business man, but no one seems to know what businesses he runs other than an IT recruiting firm named Global Conductor. IT recruiting is the slimiest of businesses and such an operation can be run with a telephone and laptop from a kitchen table. Pham got truly screwed by the CRA Saturday last. His handlers weren’t much help either as he unnecessarily stumbled over a question on his expected support of Stop Special Interest Money now, the most important ballot initiative since Prop. 187. This is also worth a look: http://www.redcounty.com/content/troy-edgar-howard-dean-republican-or-did-he-vote-john-kerry. Troy Edgar is truly a disaster waiting to happen. His juvenile, vindictive politicking on the Los Al City Council over the last few years is exactly what we don’t need in California government — the Democrats have that market cornered. 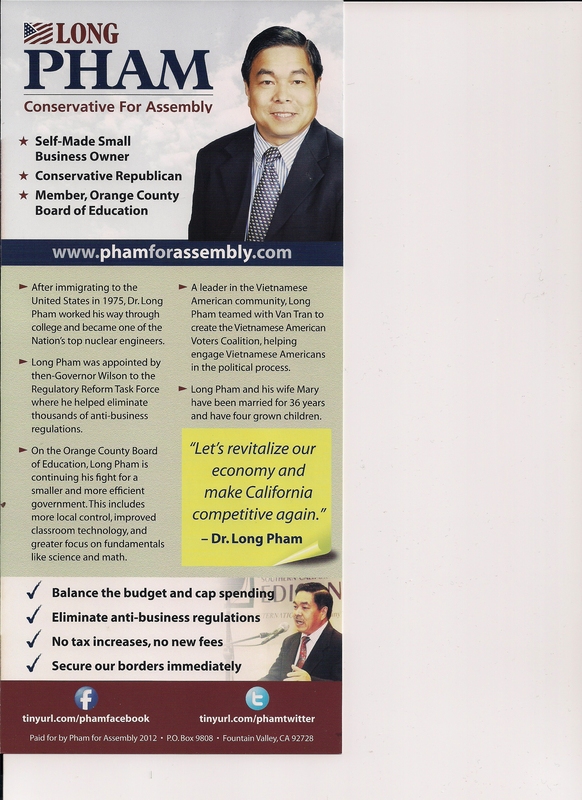 Long Pham ran against Allan Mansoor as a write in after losing the primary. He challenged Dana Rohrabacher in the primary. He didn’t get screwed by the CRA. The realized who he was and saw him for what he is.